Being a face of HOPE in your community can take many forms. We are honored to highlight the unique way Hope For The Warriors’ Board of Council member Andrew Franzone has combined his love of racing and sharing HOPE while supporting veterans and military families! Introduced to Hope For The Warriors in 2012 by close friends Mike and Angie Skinner, Franzone became intrigued with the work of our organization due to our fiscal responsibility and comprehensive approach to outreach and care. 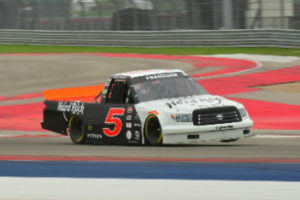 Through ATF & Gunslinger racing, Franzone, along with NASCAR Camping World Truck Series Champion Mike Skinner, has shared HOPE at race tracks in the United States and abroad. Bringing awareness to Hope For The Warriors’ mission and increasing brand recognition, the motorsports team has run logos on their cars and trucks countless times. 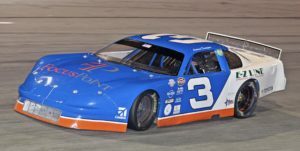 Franzone is driving one of the ATF & Gunslinger cars in the NASCAR Pro Late Model class to gain exposure for Hope For The Warriors at New Smyrna Speedway, donating advertising space and running logos on his car, as well as donating his prize money back to the organization. Franzone and his ATF & Gunslinger team also assist in carrying out the mission by inviting service members, veterans and their families to the track. Whether offering service members the once-in-a-lifetime experience to ride shotgun in a NASCAR truck, or to simply enjoy quality time together during a respite weekend for military couples, Franzone is generous with sharing the time and resources of his race team with the military community. Beyond the track, Franzone has been instrumental in cultivating additional support for Hope For The Warriors from his own network. As a result, Florence Capital Advisors selected Hope For The Warriors as the beneficiary of their annual golf tournament for the second year in a row, and individual runners selected Hope For The Warriors as their nonprofit beneficiary in the New York City Marathon. Additionally, Franzone helped facilitate an opportunity and partnership that we are excited about with Insight Financial, who is showing their commitment to restoring HOPE through free financial planning and advice for service members and military families. “When a charity is as efficient as Hope For The Warriors, when they achieve the Charity Navigator ratings like this organization does, and earn prestigious awards and honors like being recognized among the top 10 of all military nonprofits, it makes it easy to donate these resources because you know it’s going directly to the cause,” said Franzone. Hope For The Warriors is thankful for the support of Franzone, his guidance as we grow and expand our mission and his commitment to honoring veterans and military families. © 2016 a2b strategies, llc. All Rights Reserved.